Even before National Archaeology Week existed, between 1985 and 2002 QM archaeologists provided opportunities to use QM’s important archaeological collections to foster greater awareness of archaeology in Queensland. Curators gave media interviews, opened the collection for research and visitation, and would answer over 500 inquiries a year, an important vehicle for communication prior to the use of the internet. An active volunteer program was developed, where people with suitable interests and qualifications assisted in the organisation and management of the collections. A number of volunteers went on to do degrees in archaeology. The classical archaeology collection had popular public appeal and a number of temporary displays of selected pieces were undertaken to coincide with school holiday programs run by the Education Section. School activities that included archaeological ‘digs’ were popular programs. Opportunities to use significant collection pieces push the ‘archaeological message’ were also taken when ‘fillers’ were required to fill a display void. One particularly popular display filler was the cast taken from an investigation of an excavation at Southbank that revealed a deep and well preserved deposit dating from the 1840’s. Other outreach activities included a seminar series with guest experts, organised to co-inside with international exhibitions of archaeological material or to commemorate particular issues such as the centenary of the ‘The Aboriginals Protection and Restriction of the Sale of Opium Act, 1897’. Today, NAW represents a chance for archaeologists at the Museum to combine their love of archaeology with a key Museum goal – to engage our community with our collections. Our archaeology collections are broad and varied – encompassing artefacts from both Australia and overseas as well as across different time periods from recent history back to Neanderthal stone tool technologies and earlier. Museum staff are always happy to talk about archaeology. The different NAW programs over the years have showcased various projects and expertise of staff and their desire to share some of these collections, rarely on show, with our communities. In 2003, for example, QM archaeologists bought out over 100 objects from our collections which included Ancient Grecian amphora, Ancient Egyptian figurines and an embalming vase, as well as Palaeolithic and Neolithic bone tools from France. Former Senior Curator, Mr Michael Quinnell presenting a back of house tour during National Archaeology Week in 2004. In 2004 staff developed a self-guided tour which enabled visitors to move from exhibition space to exhibition space, looking for key archaeological artefacts identified and described in a specially-developed flyer and presented “Archaeology Behind the Scenes”: multiple guided tours of the collections stores, and staff from the Repatriation Unit also presented a talk on “Returning to Country” discussing the QM’s repatriation program . 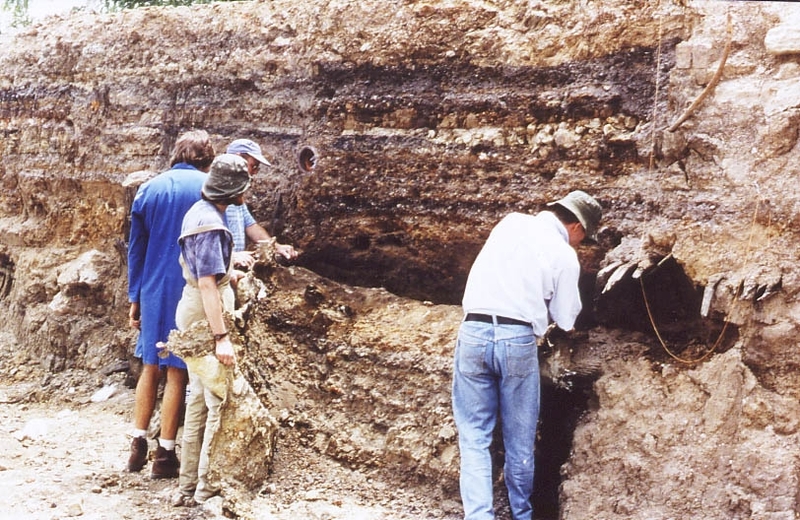 In 2005, we added to the self-guided we added a “School Student Seminar Day” presentation by 5 Queensland Archaeologists for senior school students, discussing Indigenous Australian Archaeology, the history of Historical Brisbane, Classical Archaeology and Science and Technology in Archaeology. In 2007, QM hosted a symposium in the QM Theatre, entitled “Historical Archaeology in the Spotlight” which featured four historical archaeologists, giving a public lecture on their area of research speciality in the theatre at Southbank. Topics included “Archaeologies of mining communities in Queensland”, “Australian Shipwrecks and the stories they tell”, and speakers discussing QM Collections via “Gold Pearls and Trepang: early Chinese communities in Cooktown and Cape York” and “Historical Archaeology in Australia: Popular misunderstandings and current projects”. They then participated in a “Historical Archaeology Professional Workshop” discussing contemporary issues within the historical archaeology profession including legislation, archaeological planning zones, conservation issues, and managing historical archaeological resources. Along with the public lecture, a small display of artefacts commonly recovered from historical archaeology sites was created for the duration of NAW 2007. A small segment also appeared on “Totally Wild” featuring QM archaeology featuring Commissariat Store and South Bank Stage 5. QM archaeological staff making a latex peel cast of the stratigraphy demonstrating colonial era occupation of South Bank. 2008 saw the development of a program which invited visitors to step into the shoes of an archaeologist by asking them to discover and reflect on the archaeological artefacts being displayed in the Museum at that time. Participants were invited to record/draw their favourite artefact, consider how it was made and used and what the consequences for people today may be if the artefacts were not preserved in a museum. The display “New to the Museum”, curators talks and hands on activities allowing people to engage with the science of archaeology, conducting residue analyses of hair, blood, starch and ochre. In 2009, the program moved beyond the walls of the Museum with the introduction of a walking tour, developed collaboratively between archaeologists and Queensland Museum and the Environmental Protection Agency. The walk was guided by archaeologists and covered interesting sites across Southbank, including the Queensland Performing Arts Centre where hundreds of artefacts from Brisbane’s early colonial period were recovered during the construction of the Playhouse. QM also presented the “Evolving Humans Workshop” where the early origins of humans was discussed though a hands on workshop with early human fossil casts, and presented a public talk “Before Brisvegas: the archaeology of historical Brisbane” (QM and EPA) combining a tour and public talk. Guided tours of archaeology exhibitions at QM were also presented. In 2010, we presented “The Colonial Goldfields: Visions & revisions” discussing the myths and realities of Queensland goldfields life in the late 1800s, from the traditional view as a rollicking ‘boy’s own’ adventure; wild, lawless and intensely masculine; however detailed historical and archaeological evidence from Paradise, a late 19th century Queensland gold town, reconsidered what daily life was like on the goldfields. The picture that emerges is not so much of a rough and unruly settlement as it is of an orderly, family-centred community. Between 2011 to 2016, we have sought to provide a more intimate experience for NAW visitors by bringing key collections and artefacts into the Discovery Centre to enable people to get up close and personal with them, including ‘touch and feel’ objects suitable for school-aged children to experience the past. 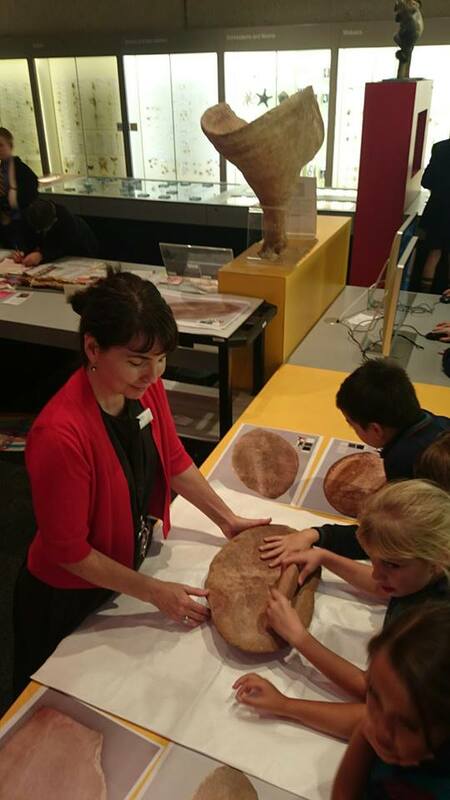 Dr Brit Asmussen, Senior Curator, Archaeology, and touch and feel object with school children. 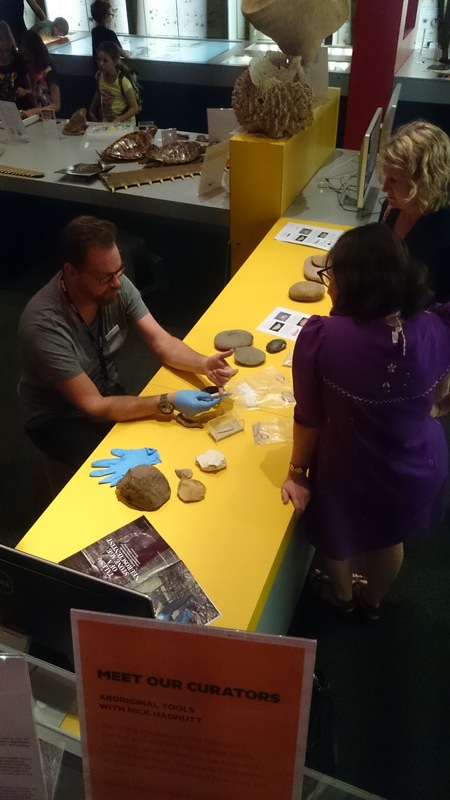 Nick Hadnutt, QM Curator of Archaeology, talks with visitors about stone tools from our archaeology collection. 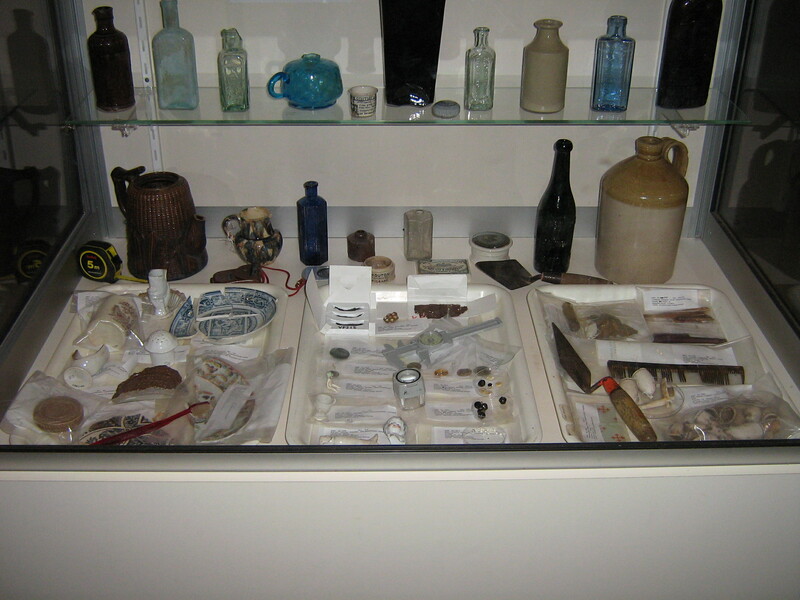 A small display of commonly found historical archaeology artefacts, on show in NAW 2007. 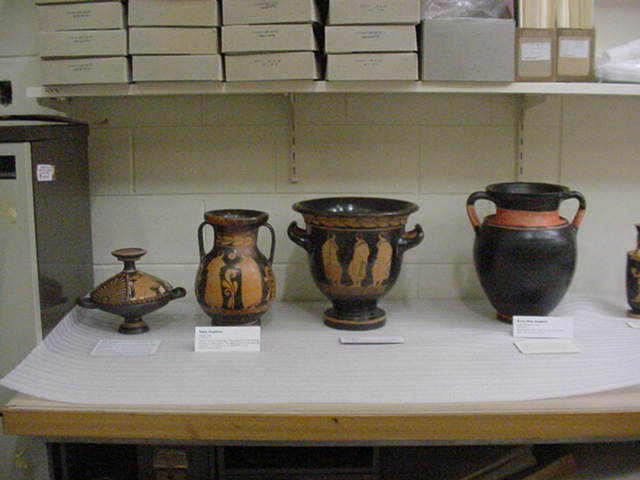 A small display of Antiquities on show in NAW 2007. Topics have covered how to identify stone artefacts and how people made them, insights from historical archaeological sites, the ways that people have negotiated climate change and significant drought events, collections history, the origins of early Palaeolithic stone tool collections from significant archaeological sites in France and England and the Book of the Dead of Amenhotep, Chief Builder, mummified birds from Ancient Egypt and objects collected by soldiers in theatres of war. These facilitated sessions allow people to ask questions about the artefacts and their history. Often these collections are personal favourites of the archaeologists so people can get a personal perspective of them as well as ask the archaeologists about their work, their career path and their research interests. For us, National Archaeology Week continues to offer a great experience for the public to see what we find fascinating. It continues to remind us that telling people about what we discover is a key part of being an archaeologist. It also is a moment in time for us to reflect on what we have seen and done in our recent careers and to recharge our excitement in dealing with sites and artefacts that is at the heart of archaeology. Finally, it reaffirms the importance of telling stories of the past through the material culture that is cared for in the Museum.